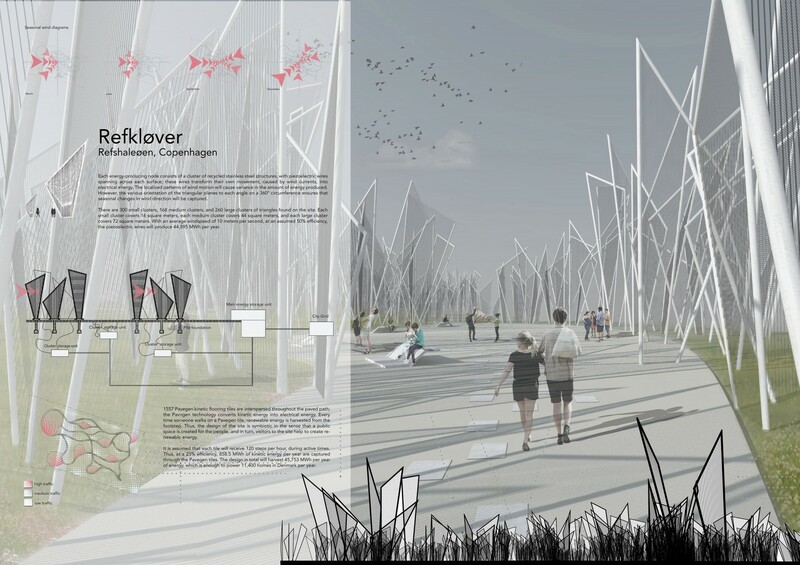 The design for Refkløver is a dynamic combination of biomimicry of the region’s botanical species with Norse mythology. Taken from microscopic studies of the Danish national flower, the rødkløver (red clover, Trifolium pratense), the form of the energy-generating structures mimics the veins found on the leaves and bracts of the plant. These veins act as highways for photosynethetic processes, transporting energy and sugars to the rest of the plant. The design of Refkløver acts in a similar way. Using piezoelectric wires to represent the veins of the plant, wind movement will generate energy through these delicate fibers, and will be transported to the city grid. Further merging traditions of Norse mythology, the experience of the meandering and interconnecting pathways is derived from the idea of a labyrinth. With no dead ends, the fluidity of the pathways incites a meditation through travel by foot, allowing the mind to wander and be found again at critical viewpoints. The design emerges as a participatory event, as further energy will be produced by foot traffic via the use of kinetic flooring tiles. Drawing from the urban design characteristics of Copenhagen’s public spaces, Refkløver is a space of symbiosis between people and the landscape. 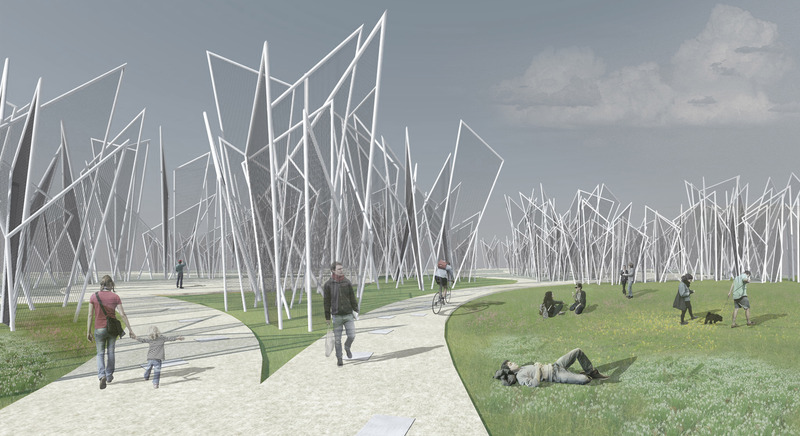 A system of active walkways will connect passive nodes, which are guarded by the sculptural forms, making visitors feel like a very small organism within the epicenter of the red clover. Refkløver will contribute to the idea of free and open public spaces for everyone that enhances the developing community of Refshaleøen. The space provides a harbor-front park for the people of Copenhagen, and the people of Copenhagen help generate energy for the city’s grid by occupying and moving through the site. Plants were selected based on their flowering season, relevance to local ecosystems, and references in Norse mythology. Freya, the Norse goddess of love, beauty and war, is said to have flowers falling from her hair. Species mentioned in the mythology that are used for Refkløver include milkwort (Polygala vulgaris), cowslip (Primula veris) and sea aster (Aster tripolium). The key plant species in the planting scheme is the red clover (Trifolium pratense), Denmark’s national flower. 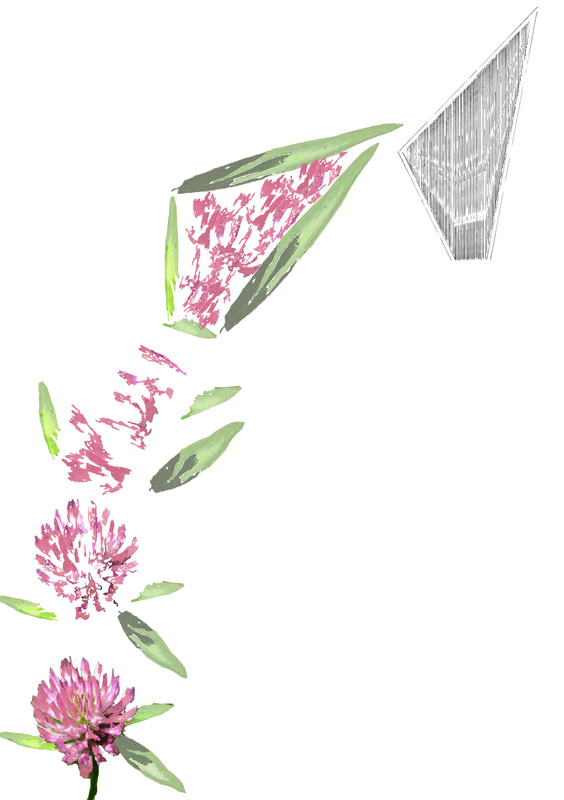 The red clover is known to have healing properties for soil, agricultural utility, and humans. The importance of the planting design is integral to the concept of the site design, as the form of the energy-generating structures is botanic in nature, and the entire site mimics the natural processes found in the plant kingdom. The variety of species ensures seasonal change and cover throughout the year, providing an aesthetic environment and healthy ecology in all twelve months. To increase plant biodiversity on site, a botanical theme was chosen and implemented via the form of the energy-generating structures, as well as a detailed planting palette with plants significant to Danish ecology and culture. The semi-transparency of the structures allows sunlight to reach the surrounding planting areas. The plantings absorb CO2, enhancing Denmark’s efforts to achieve a carbon neutral status by 2025. Planting spaces offer habitat, increasing biodiversity in this unique area. Plants are attractors for pollinators, such as butterflies and bees. Key bird species that will benefit are the smew (Mergellus albellus), white-tailed Eagle (Haliaeetus albicilla), crane (Grus grus), broad-billed Sandpiper (Limicola falcinellus), Caspian Tern (Sterna caspia), and waxwing (Bombycilla garrulus). Refkløver brings foot traffic to this developing area, but can also be used as a serene escape onto the waterfront. The design for the site acts as a gateway to Refshaleøen, as visitors disembarking from the water taxi will interact with the site design upon leaving the terminal. The vertical energy-generating structures are a subtle silhouette along the panorama of the harbor, drawing intrigue and curiosity to the developing area of Refshaleøen without being a clichéd symbol of Danish culture. James Croll (1821-1890), originally from Perth, was a scientist whose numerous contributions were revolutionary to the fields of geology and climatology. Croll is responsible for the theory of glaciation and explaining the transport of erratic boulders via sheets of ice during glacial periods. To honour James Croll’s scientific contributions, the focal point of the garden is a glacial boulder, which is split in two pieces and straddles either side of the existing glass wall. The boulder is balanced by a shallow concave dip on the opposite side of the garden, which suggests the boulder had a previous location. The mass of the boulder and the void of the hole imply the the process of glaciation and incite dialogue about this concept through spatial experience. The initial focal point of the garden is a glacial boulder, curiously cut in two pieces by the existing glass pane adjacent to the sidewalk. The viewer then notices the dark dip in the garden, which is intriguingly identical in shape to the glacial boulder. By placing part of the boulder outside of the garden’s formal boundaries, pedestrian interest is drawn to the space, raising interest for the garden and Croll’s discoveries. Using specialised machinery, the glacial boulder can be split into two pieces, to create the illusion that it is moving through the glass pane. The intrigue incited by the boulder’s placement encourages the viewer to become more finely attuned to the nuances in the garden space. Design package prepared for Bachelor of Landscape Architecture undergraduate thesis project at the California Polytechnic State University San Luis Obispo. The Tijuana River Watershed covers 1,750 square miles of land, spanning across the United States- Mexico border. As the kidney of the watershed, the Tijuana Estuary acts as the final buffer for this watershed, and its effluents, before water enters the Pacific Ocean. Historically, the Tijuana Estuary has fulfilled its role of filtering and utilizing the water through wetland processes. However, recent increases in population, along with increases in pollution and lack of environmental responsibility have jeopardized the integrity of the Tijuana Estuary, and the many habitats that it supports. On average, 200 pounds of waste are collected on the beach adjacent to the Tijuana Estuary per year. Plastics are among the most common type of trash collected. While much of this trash can be attributed to the lack of infrastructure and underdeveloped waste management policies in Mexico, specifically in the more destitute regions of Tijuana, the effects of this trash on a critical ecosystem bring a larger issue about consumption into question. The way plastics are used, as single-use and disposable items, is threatening our planet’s sanctity. The lifespan of plastic further complicates the problem, as plastic breaks down into smaller plastic pieces, rather than decomposing. According to a 2012 US News Report, the ocean has 100 times more of these “microplastic” particles in it today than it did in the 1970’s. Microplastics are particularly troublesome because they are difficult to capture, and are easily ingested by birds and other marine animals. The overarching principle of the Tijuana River Trail is to inspire political and social awareness and activism, in order to find solutions to address the growing problem of plastic litter and contamination in the world’s waterways. By spanning across the San Diego-Tijuana border, the trail network will incite cooperation between the two countries, bringing the people of these regions together to transform an area of neglect into a model for the future. This design was completed as part of the Landscape Architecture 403: Natural Environments Design Focus Studio at the California Polytechnic University San Luis Obispo. The Piedras Blancas Light Station Outstanding Natural Area is located in northern San Luis Obispo County, just north of San Simeon. This stretch of coast is between Los Angeles and San Francisco. The Outstanding Natural Area spans the coast for approximately 4.5 miles surrounding the Piedras Blancas Light Station. This area includes the immediate acreage of the lighthouse facilities, coastal natural resource areas, and sites of cultural significance. 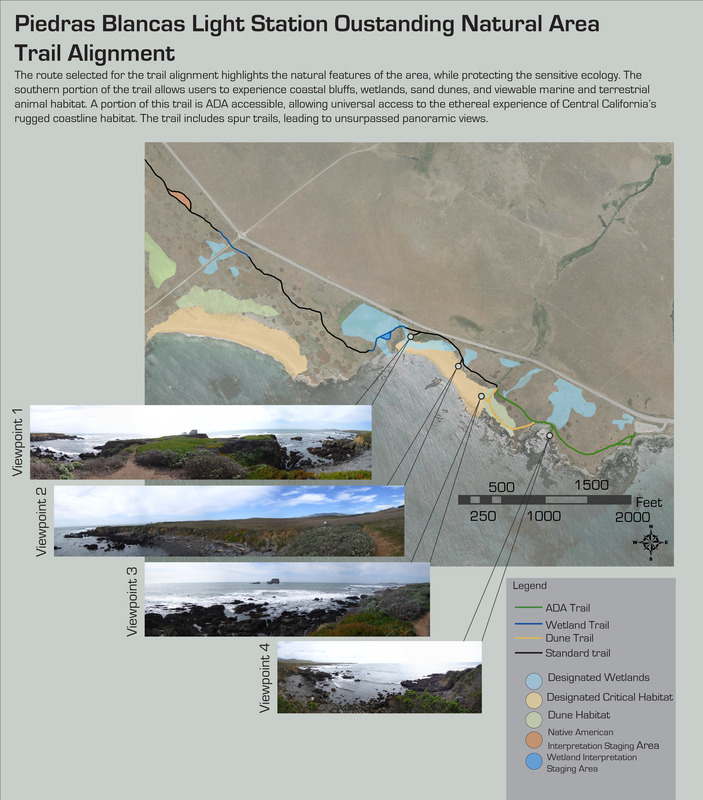 Informed by a thorough environmental site analysis and research process, the design prescription for the site includes the re-alignment of the current coastal trail to enhance regeneration of critical habitat areas, along with the design of new interpretive trail segments that speak to the cultural and natural heritage of the site. Trail design and maintenance guidelines and a management plan were included in the design submission. The wetlands located on-site are seasonal. These wetlands are essential for habitat and ecological functions. Along an undulating boardwalk, cylinders of varying heights represent the amount of water present in the wetlands at different times of year. The location of this interpretation area is adjacent to a seasonal wetland, educating visitors about the functions of the site, as well as drawing a connection between the wetlands and the ocean. In doing so, a larger picture will be painted regarding the hydrology of the area. Remnants of Native American life have been found on the site. This rock garden will create an opportunity for visitors to connect with the Chumash culture. Additionally, the elements of the rock garden will draw visitors closer to the nuances of the site, providing directional alignment and a greater awareness of the site’s natural characteristics. This concept originated from the Chumash belief that the seasons were affiliated with the cardinal points. Signage further explains this association.